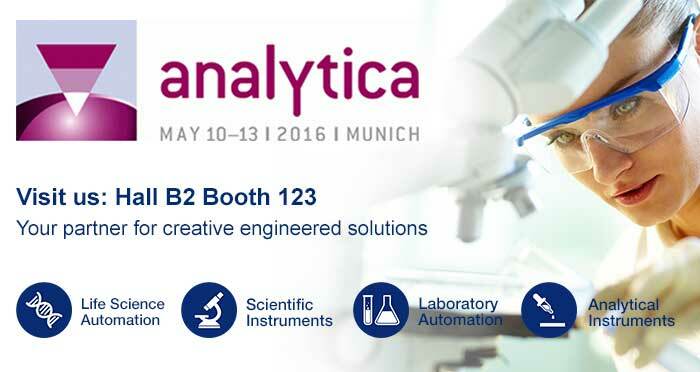 Reliance Precision will be in Hall B2, Booth 123 at Analytica to discuss its 1, 2, 3 design and development approach of 1, modelling, 2, reliability and 3, validation which makes Reliance the partner of choice for life science and diagnostic equipment manufacturers looking for quality components and sub-assemblies right through to full product design. The Reliance team will detail how the reliability of their standardised components and sub-assemblies enables “quick to market design” and the use of proven standards reduces development cost. They will explain how this helps both large and small firms provide robust systems, with case study evidence, for example describing how its Cool Muscle motors are being used successfully in over 500 Biosafe Sepax automated cell processing systems. They will also show components such as Linear Actuators for positioning optics, lenses and lasers and Quadrupole Mass Filters used in world leading high quality mass spectrometers. On the Booth, technical experts will explain how unique modelling software and other techniques are used to determine in what manner assemblies such as quadrupoles will perform in a specific instrument. They will detail how this approach, which sets Reliance apart from other developers, can help to optimise a system’s final design. Reliance, a niche industrialiser, can produce 50-200 full systems per year (up to 1000 units when required) and operates in a clean assembly environment utilising manufacturing and engineering skills of the highest calibre, to deliver product validation as the final piece of its 1,2,3 development approach.